Indie Hops Celebrates Beer, Bikes, Kids and Good Health! Under gunmetal grey skies with a chill wind blowing off the Pacific Ocean, the action on the clean streets of Dana Point was red hot. We saw and felt it all: the thrill of fierce competition, the joy of cheering on children pedaling with all their heart, the pride of a community rallying to support noble charities, and the grief of honoring the life of Jorge Alvarado, a young racer killed before his prime a few days before by a street-racing motorist in Redlands. It was a banner day. 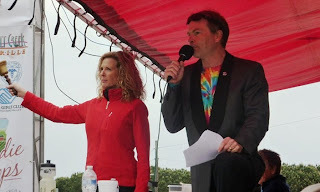 Over 800 cyclists in 10 categories raced their butts off for over $30,000 in cash and prizes. Even better, at least 300 children, ages 4-15, lined up in multiple age group categories to thrill the crowd and tv audience with their spirit, speed and happy faces. All proceeds from the race will be donated to charity, including the Boys and Girls Club of Capistrano Valley and the 5th Marine Support Group. Indie Hops is proud to associate with quality beer and a salubrious lifestyle. Salubrious! Check it out: it means "enhancing well-being" or promoting the good life. Cycling is a perfect platform for trumpeting the virtues of a well-hopped malted beverage. In order to maximize what their bodies can put out, cyclists in general are very meticulous about what food and drink they put in -- it's got to be good, real good. Quality over quantity. I always say that if I'm going to limit my beer intake to one-a-day, it better deliver on all counts. It better have plenty of nutritious malt and anti-oxidant rich hop oils and tannins. It needs to emit an aroma that whispers: relax and enjoy, you've earned it. And of course it needs the right amount of alcohol that can help liberate you from any festering deadweight that may be holding you down. I want to thank my good friends at Karl Strauss. KS delivered big time. They donated several kegs of Woodie Gold, Amber lager, Pintail Pale Ale and Red Trolley to the beer tent, the proceeds of which will be donated to the 5th Marine Support Group out of Camp Pendleton. Hoo-rah! And a special shout out to Chris Cramer, the CEO of Karl Strauss. He delivered several cases of muscular Big Barrel Double IPA to the race VIP event and later that night we toasted to their Gold Medal winning Red Trolley over a few bottles of Belgian-Style Anniversary Ale. I broke my one-a-day rule to pieces but it was worth it -- the bewitching brew transported me to the rolling hop fields of Poperinge, Belgium (saving a fortune on air fare!) and that night I slept like a baby. In June, Indie Hops will be sponsoring the Mt. Hood Cycling Classic in Portland, Oregon. We will be inviting all the local brewers to join in the fun. 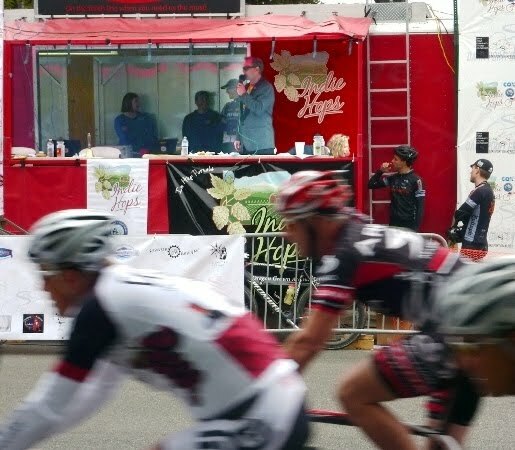 Our long term vision is to work with Oregon State University in conducting single hop variety brew sensory panels in conjunction with major bike races. Imbibing hopped up beverages in the name of science! Who knew data collection could be so much fun? A big thanks to the Dana Point Community Cycling Foundation, the City of Dana Point, and all the sponsors and volunteers who made the 4th Annual Indie Hops Dana Point Grand Prix a great day for sport, family and quality beer. I had a blast on the mic and can't wait to do it again. For an excellent video of the race in all its glory (and savagery), click here. Here is my interview with Cox Cable. Gnarly! Aromas? Yes. But Can the Willamette Valley Handle Dual Purpose Heavies Like Centennial, Horizon and Chinook? If the Willamette Valley is renown for its aroma hops and Yakima Valley for it’s high alpha, where do “dual purpose” hops fit in? Since most mid to high alpha hops hail from Yakima, does that mean they don’t or wouldn’t thrive in Oregon? “Dual purpose” is a term of art that first emerged in the mid 1990s, about the time that our hopmeister Dr. Al was hanging up his cover-alls and putting away his clipboard. “We never used that term,” recalled Al. By the mid 1970s, the emphasis shifted. “General kettle hops” went the way of the Do-Do as the Big Boys simplified the choice between aroma and high alpha. It wasn’t until the 1990s, that a third party re-emerged, this time at the urging of the craft brewers, who demanded the best from both worlds -- hops that could be used for bittering and European style aroma. Thus was born the utility or “dual purpose” hop. The closest thing to a “dual purpose” in Al’s hey day was Perle. When grown in Oregon, which is lower in latitude than its home-hopyard in Germany, Perle alpha averaged around 10-11% AA, which back in the day came pretty close to the high water mark for alpha hops. To qualify as a noble aroma, however, a hop needed to have storagability similar to the classic old-time aromas such as Hallertauer mittelfrueh, Tettnanger or Saazer. A hop’s storagability, explains Al, is an index for measuring the life a hop’s original alpha acid content. Which to me sounds like hops, like wine, can age with grace. Instead of evaporating down to nothing, the hop oils and acids instead can generate new downstream compounds. Whether a hop is a good, fair or poor keeper is really a message to the grower on the level of TLC that will be required to preserve the best of the good stuff. Why? Because mishandling a hop during or after harvest compounds the natural loss or degradation of alpha acids. How is that measured? It isn’t. To know whether a hop has been handled, you need to know the skill, patience and infrastructure of your grower, as well as your supplier. Let’s go back full circle to Perle. Perle’s “good” storagability made it too good to hang with the “poor keeper” nobles. In the brewing process, Perle acted more like a high alpha hop than a finicky, thin skinned and easily bruised noble. Nowadays, in addition to having fair to good storagability, dual purpose hops are generally about twice as high in alpha than nobles, with about twice the total oils. Signature examples are Centennial (11-14% AA, 2.5 oil ml/100g) and Horizon (12-14% AA, 2.0 oil), the latter being another one of Dr. Al’s hop creations (released in 1998 after Al retired). Dr. Al did not make the crosses for Centennial, which was originally bred at the USDA facility in Prosser, Washington. Dr. Al did assist in field testing the selection in Oregon. Although Dr. Al had a hand in the creation or testing of these four high alpha/medium aroma cultivars, none of them – Centennial, Chinook, Horizon or Newport, and you can add Mt. Raineer to that list - have flourished commercially in the Willamette Valley. To be sure, Horizon, Mt. Raineer and Newport have failed to catch on anywhere, whether in Oregon, Idaho or Washington. With respect to Chinook, which ranks as the 5th highest use hop by craft brewers (BA 2009 hop usage survey), the entire US crop of such hops in 2009 was harvested in Washington. As for Centennial, surpassed only by Cascade as the most popular hop in 2009 among crafties, only two Oregon growers harvested Centennial in 2009, both going off radar to do so. Washington brought home nearly the entire supply. Why is this? Do dual purpose hops grow better in the Yakima Valley? Are the yields in Yakima higher? Are Oregon growers not up the challenge? Do dual purpose hops “keep” or “store” better in the high plains of Eastern Washington? According to Al, the answer has to do with history, habit and logistics and nothing to do with terroir, or farmer skill, or passion. Hops in general don’t like heat, but higher alpha hops in particular have been known to combust or “self-ignite” when not properly cooled and stored. It’s imperative, stressed Dr. Al, that before stacking bales in a warehouse, the temperature at the core of the bale, as well as the ambient temperature, must be brought down to the 70s. 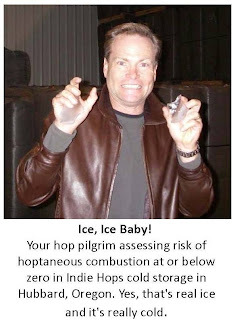 Hops with high total oils, such as Bullion, Chinook, Newport and Centennial, can generate tremendous heat inside a tightly compressed 200 pound bale. The heat needs to dissipate. It’s critical, reminds Al, that hops be allowed to cool off after drying in a loose stack when removed form the kiln. “If you bale them while they’re hot, and stack them up end on end in a closed room without allowing the heat to dissipate,” Al warns gravely, “they’ll self ignite. They’ll blow.” As in sky high. As in you better have good insurance. If heat is an enemy, then the Willamette Valley must be a safe harbor. By comparison, the day time ambient temperatures in the Valley around harvest time are six (6) degrees cooler than in Yakima. Impatience is another enemy. Hops must be allowed to cool down for at least 18-24 hours before baling. Hops are dried in the kiln at about 140F (often much higher on especially hot summer days). The optimal temp of a baled hop before storage should hover around 72F. The optimal temp of baled hops in in cold storage drops below freezing. A hop baled before it’s time and temp is a recipe for blackened, oxidized hops, or worse. Ka-Blam! What about yields? According to Al, the yields between Oregon and Washington should be compatible. What about alpha acid product? Compatible. What about disease resistance? Per Dr. Al, growing Chinook in Oregon may pose a challenge because of the risk of downy mildew. However, he assures, that risk can be managed by good farming technique and vigilance. What about those Oregon-grown Centennials? Are they any good? I haven’t seen any data comparing the chemistry profiles, not that the numbers alone tell the story. We have received feedback from brewers who have used Centennials harvested in 2009 from Goschie Farms (one of our farm partners). In so many words, the consensus sounded something like … err uhh, Damn! This is good sh**! Here at Indie Hops, we’re satisfied that the Willamette Valley terroir is well suited for both aroma and dual purpose varieties. In the end, it comes down to the talent, skill, patience, experience and passion of the grower. We’ve got two of the finest in Goschie Farms and Coleman Farms. In 2010, Indie will be planting “Salmon Safe” Chinook (gotta love that! 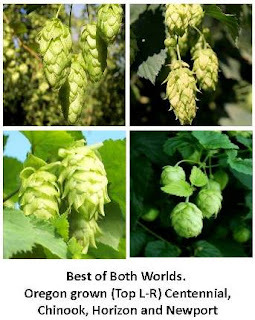 ), Centennial, Horizon, Perle, and a host of aroma hops (e.g., Cascade, Liberty, Mt. Hood, Ultra, Goldings, Santiam, Crystal and Columbia). If storage is a problem, we can fix that. We’ve got the space. Our patient pelleting mill is now running, which means there’s no need to truck Oregon’s finest beer flower 250 miles to Yakima in the dog days of August. We’ll be able to quickly convert baled cones into fresh, oily, happy pellets within a few days of harvest. We’ve lowered the temperature of the pelleting die below 110 degrees F and our storage cooler is always below freezing.